Choosing Pomeranian Breeders " "
Inspecting the premise of Pomeranian breeders is an important part of selecting a dog. Where a dog is kept from the time it is born until the time it is provided with an owner and a new home, influences the puppy’s temperament. A reputable breeder will raise a Pomeranian pup in a clean and loving environment. Quality dog supplies and equipment – a responsible breeder is serious about their business, and will provide their dogs with nothing but the best care and attention. Therefore, you should look for whelping beds, crates, puppy pens and grooming tables. You should also notice toys, blankets, and other pleasant supplies that help to keep dogs happy. Good dog food – Legitimate Pomeranian breeders will only give their pups the best nutritional dog food. They will either purchase an excellent dog food brand, or make their own food. Clean environment – the environment that the puppies are raised in should be clean and safe. There should be no excessive odors or putrid smells. Floors should be clean, and you shouldn’t be able to find dog waste anywhere inside the premise where the dogs are kept. Are the dogs happy? – Pay close attention to the dogs in the premise. Do they appear happy and healthy? Do their eyes look bright and are they sociable with you and the other dogs in the liter? A reputable breeder will have socialized the dogs, so the pups will be used to human contact. Pomeranian breeders who take part in a legitimate breeding practice will not hesitate to show you the premise where they keep the dogs. They should be glad to show you the kennel and tell you about the breeding process. If you come across a breeder who is not willing to take you around the premise, or you have questions that have not been answered to your satisfaction, take your business elsewhere. 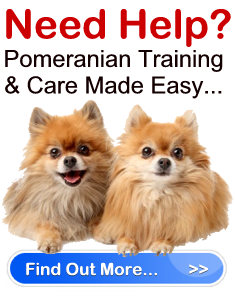 Ideal Pomeranian breeders should keep no secrets from you about their business. It is your right as a customer, and future dog owner, to know everything about the puppy you are interested in making part of your family.